The sole surviving EU04-24 (LEW 6701/1955), photographed in Jaworzyna Śląska on August 4, 2004. …and final version (late 1970s); note self-acting brake. Both drawings by M. Ćwikła from SK vol.7/2001. Another picture of the EU0-24, taken on June 18, 2012, after external refurbishment. Photo by Alfvanbeem (www.commons.wikimedia.org). First electric locomotives in post-war PKP service were classes EP01 (two pre-war machines of British origin), EP02 (eight examples – modernized variant of the former, differing mainly in body and suspension, built in Poland) and EP03 (eight machines supplied from Sweden by ASEA in 1951 and 1952). None of these types could at that time be considered modern and offer much development potential. Their first job was to haul transit passenger trains through central Warsaw (so-called Diameter Line), but with long-distance trains they were not entirely satisfactory. Polish locomotive industry was not yet ready to undertake design and manufacture of such locomotives and supplies from some Eastern Block countries were at that time the only acceptable solution. The choice fell on VEB Lokomotivbau-Elektrotechnische Werke ‘Hans Beimler’ of Hennigsdorf, Eastern Germany (known by the abbreviation LEW – former AEG and Borsig plant, now a part of Bombardier), which had had some experience with electric locomotives, although had never built any with DC engines. Negotiations started in 1950 and detailed design was prepared between 1952 and 1954 with participation of Polish specialists. Two prototypes – serial numbers 6678/1954 and 6679/1954 – were delivered in January 1955 and designated E201 and E202, respectively (first electric locomotives in PKP service had no class designations, only service numbers preceded by capital ‘E’ letter). The entire batch numbered 25 examples and last of them were accepted in March 1956. In 1955 these locomotives were classed E04 and later, in accordance with new standard issued in 1958, re-classed EU04. 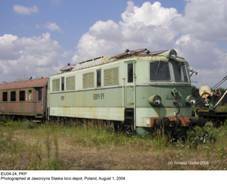 As with all new electric locomotives, they were first based in Warsaw and later, with mounting supplies of more modern and reliable EU05s and EU06s, moved to other areas, mainly in southern Poland. Of course, long-distance passenger traffic was their first domain; they had been designed to haul 650-tonne drafts at 100 km/h and maximum speed was set at 110 km/h. EU04s were classed as universal machines and could haul drafts up to 1800 tonnes at 70 km/h (or over 3000 tonnes double-headed), but were initially seldom used with freight trains. At the time of their introduction, EU04s were the most modern electric locomotives in PKP service. They were the first locomotives with modern two-stage suspension, provisions for electric car heating and even wash-basins and kitchenettes for crews. Due to modern suspension and long truck base, running qualities were good, but axle load of 21.5 tonnes was, by Polish standards, high; previous four-axle electric locomotives in PKP service were lighter by a few tonnes. The main reason was heavy electric equipment: its weight was 40.5 tonnes, compared to 31.5 tonnes in EP02 and 33.5 tonnes in EP03 (the latter with only slightly lower rated power). The most serious shortcoming was, however, a flaw of truck frame design which, together with poor welding quality, often resulted in fractures. There were also other minor shortcomings, concerning mainly electric equipment; in particular, cast-iron startup resistors overheated and were prone to failures. Availability was thus initially much below expectations. In-service modernizations – apart from installation of self-acting brakes in mid-1960s – were few and concerned mainly minor items of equipment. In 1966, all EU04s were transferred to Upper Silesia and from mid-1970s they were gradually shifted to local traffic and secondary duties. Supplanted in passenger traffic by superior Czechoslovak and British machines – and later license-built variant of the latter – they ended their service with PKP hauling freight trains. EU04-06 and EU04-25 were written off in 1965 and 1974, respectively (probably as a result of accidents), but withdrawal of the entire class started in February 1978 with EU04-07 and EU04-13. Last examples in service were EU04-11 and EU04-18, written off in March 1983; the latter ended up as the stationary heating car in Bielsko. 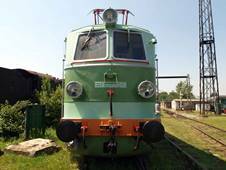 EU04-24 (s/n 6701/1955), withdrawn from service in June 1982, is now on static display at the Industry and Railway Museum (former locomotive depot) in Jaworzyna Śląska. Class EU04 was followed by 34 more powerful six-axle locomotives, supplied by LEW between 1955 and 1958. Classed EU20, these machines were intended mainly for freight traffic. They had much in common with their predecessors (e.g. traction engines were the same) and unfortunately proved equally unreliable in service.